Hey everybody! It's Monday again and that means another wild week of What Will You Stamp! If you're new to my blog, then let me tell you what WWYS is... It's an awesome challenge blog that features one Stampin' Up! stamp set per week. If you've ever had a set that just stumps you check out our blog-if we've featured the stamp set then there will be plenty of ideas for you! If we are featuring a set that really gets your creativity flowing then we hope you will join us by adding your contributions to the What Will You Stamp Challenge Blog page. 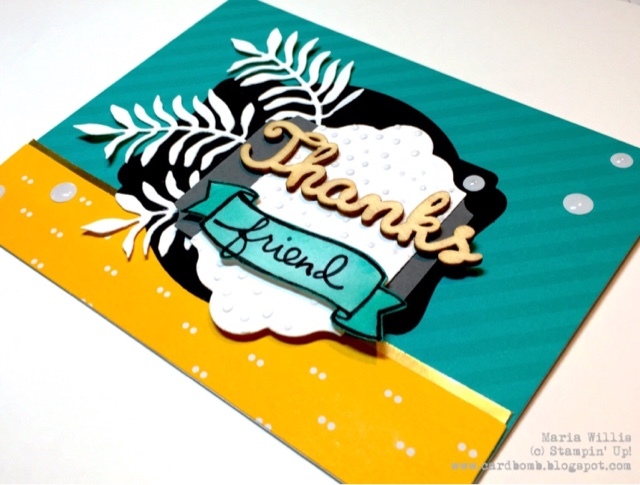 This week we are featuring Endless Thanks and I am really excited about my card this week. I wanted to do lots of fun layers so believe it or not I picked up all of these layers off of my craft table. I had cut all of them out for other projects and decided for whatever reason not to use them. I am a paper hoarder and will not throw anything useful out so all of these random pieces were just sitting there waiting for me to use them. I'm so happy with how beautifully they came together to make this card! I hope you like it too. Please leave me a comment and let me know what you think! Do you ever make cards out of all of your scraps? Do you feel like they come together well? Here's a little close up of the sentiment. I love the banner from this set and "friend" just fits so perfectly inside of there. The wooden "Thanks" gave this card a nice bit of texture and I finally got to use the white leaves from the Botanical Builder Framelits Dies! I swear I punched those little beauties out in November the day after I got that bundle! If you're wondering where you can check the Botanical Bundle out you are in LUCK! Our new Occasions Catalog went live yesterday and pretty much everything in it is to die for! Combine that with FREE products from Sale-A-Bration for every $50 purchase (the best sale of the year) and we are all winning! Just FYI, if you have been thinking about joining Stampin' Up! this is the time to do it! For $99 you can join and receive $155 in product of your choice! Let me know if you are interested in hearing more! I myself joined during Sale-A-Bration two years ago and have never looked back! In case you haven't had a chance to check it out closely here's what the whole Endless Thanks set looks like. It's pretty awesome! Thanks for stopping by today! I hope you will check out the rest of the design team's amazing projects over at the What Will You Stamp Challenge Blog! If you have any questions about Sale-A-Bration and earning FREE PRODUCTS, or, if you're interested in joining my team please let me know! I would love to answer any questions that you may have!